Well, it's finally here! After several month of anticipation, the arrival of the new BlackBerry KEYone smartphone in Canada is finally upon us. Starting tomorrow (May 31st), the BlackBerry KEYone will be available via Bell, Bell MTS, Rogers, SaskTel and TELUS starting at $199 CAD on a two year term. It will also be available unlocked for $729 CAD outright in June. Do you live in Canada? Are you a Rogers customer? Good news! The Priv by BlackBerry KEYone is available for pre-order starting today! Rogers has made good on its promise of carrying the device, with pre-orders going live this morning. The device is available for $0 on their Premium +, $199 on Premium, $349 on Smart & $439 on Talk & Text. Jim Mackey, BlackBerry's head of corporate development and strategy, has left the company since mid-February, according to reports from Reuters. "It is true I left BlackBerry as of Feb. 13," Mackey, who was executive vice president, executive operations, said in a LinkedIn message in response to a Reuters inquiry. BlackBerry’s new Android phone KEYone includes an added layer of security and convenience based on world-leading biometrics company Fingerprint Cards’ (Fingerprints) touch sensor FPC1145. The world premiere of a fingerprint sensor in the keyboard of BlackBerry KEYone is the result of a close collaboration between BlackBerry’s hardware-team and Fingerprints. If you're looking to get a BlackBerry KEYone from Rogers you'll be happy to know that the carrier has confirmed that the device will be launching on their network in April. If you're looking to get a BlackBerry KEYone from BELL you'll be happy to know that the carrier has confirmed that the device will be launching on their network in Late April. If you're looking to get a BlackBerry KEYone from TELUS you'll be happy to know that the carrier has confirmed that the device will be launching on their network in April. This confirmation comes less than 36 hours after BlackBerry Mobile acknowledged that the KEYone would be available globally in April. The BlackBerry KEYone was launched less than 36 hours ago at Mobile World Congress, but loyal BlackBerry user in Canada can “get first access to purchase” the QWERTY Android device by signing up on the official BlackBerry KEYone page. We are less than 16 hours away from BlackBerry Mobile's unveiling of the codenamed Mercury device. The return to the iconic QWERTY keyboard in a Android-based smartphone is getting many tech enthusiasts excited! The inevitable has finally happened. BlackBerry today announced the launch of a software licensing program for several of its apps by introducing the BlackBerry® Hub+ for Android. BlackBerry Hub+ for Android is a suite of applications that includes the BlackBerry Hub, calendar, contacts, notes, tasks, device search, launcher and password keeper applications for Android smartphones. Users can download a free trial from Google Play and access BlackBerry Hub+ from any Android device running 6.0 Marshmallow, with a cost of $0.99/month after the 30-day trial. WATERLOO, ONTARIO--(Marketwired - Aug. 3, 2016) - BlackBerry Limited (NASDAQ:BBRY)(TSX:BB), a global leader in secure mobile communications, announced today the launch of a software licensing program for its Mobility Solutions business by introducing the BlackBerry® Hub+ for Android. A suite of BlackBerry applications, BlackBerry Hub+ makes productivity and communication on Android 6.0 Marshmallow smartphones effortless. 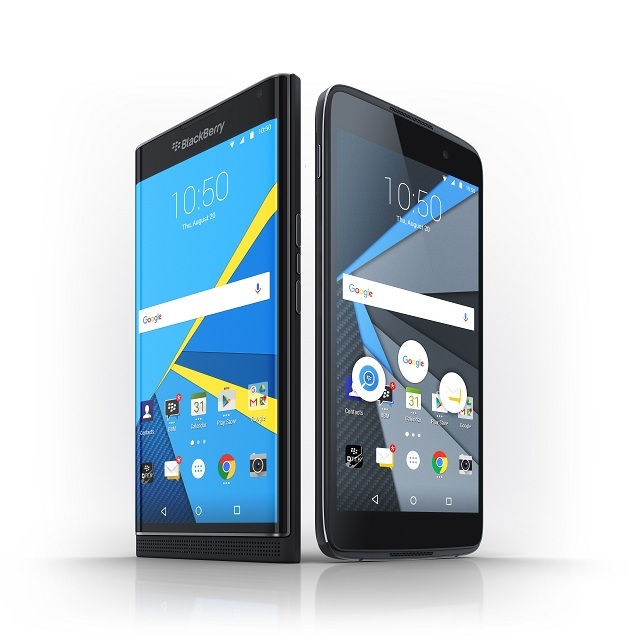 BlackBerry has officially announced the DTEK50, its first full-touch Android smartphone. Branded as the world's most secure Android smartphone, BlackBerry has hardened the OS on the DTEK50, and added a secure boot process. The DTEK50 is available for pre-order from ShopBlackBerry.com in the U.S., Canada, UK, France, Germany, Spain, Italy and the Netherlands. Pricing at launch is $299 USD, and should be available from several carriers worldwide in the coming weeks. BlackBerry's next Android is set to be announced later today, and we are now finally seeing leaked press images start to pop up. Earlier this morning, someone accidentally hit the ON switch for the BlackBerry Neon/DTEK50 page, temporarily allowing several die-hard fans to peek at the official press images. Along with the images, the full list of specifications was also live for that short period, luckily preserved by Google Cache.